THIS! This is hands down one of our very favorite builds! If you caught the Davis episode of our show, Open Concept on HGTV, then you remember this piece well! We built this piece together for the Davis’ new dining area. They had a beautiful brick wall that we saved and repainted but we thought the space needed something to break up the huge white wall. Mary mentioned that she loved barn doors, so we came up with a high back bench that resembled a barn door but offers seating at their dining table, too! This is a simple build and it’s super easy to customize it! You can print the FREE printable plans by clicking HERE! You can also follow along with us as we show you how we built the piece, below. We started by making all of the cuts for our frame. Then we used our Kreg Jig K5 to drill 1 1/2″ pocket holes into the short 2×4 pieces. Refer to the plans for pocket hole placement. You can find the Kreg Jig model that we like HERE on Amazon. Next, we constructed the front and back of the bench frame. We attached the two long pieces together with the short pieces in between, with 2 1/2″ pocket hole screws and wood glue. Once the front and back frames were built, we attached them together with short 2×4 pieces. We used 2 1/2″ pocket hole screws and wood glue. To cover the frame, we used 1/4″ Purebond Plywood sheets. We had these ripped at Home Depot then cross cut them to fit. Make sure you measure before you cut the length on the plywood. We used Purebond Plywood on this project for so many reason. No. 1, it is plywood but it has a veneer over it that allows it to stain beautifully and it’s made in AMERICA! 🙂 You can find out more about why we use PureBond HERE! Once the trim pieces are on, cut the bench top to size. We used 3/4″ Purebond Plywood for the top. There should be a 1″ overhang on the front and sides of the bench and it should be flush on the back. To cover the rough plywood edges, we used sticks of screen mold. Measure and cut the screen mold to fit and attach it with brad nails and wood glue. We like to start with the front piece of screen mold. We mitered both ends at 45 degrees then you can miter the side pieces and just cut off of the straight end to make a perfect fit! Now for the high back! Cut the 1×6 boards to size and drill 3/4″ pocket holes according to the plans. Now, create the + design and attach the pieces with 1 1/2″ pocket hole screws. To make the angle cuts easy, put the board under the frame and mark where you should make the cut, line up the miter angle to match the line on the board and make your cut. Do this for ever angle. The angle pieces won’t be attached until we have the back of the bench on. We attached the frame to the back of the bench with 1 1/4″ pocket hole screws. Attach the backing at least 1/4″ from the back of the bench top to leave space for the 1/4″ plywood backing. This piece will be resting against a wall but if yours doesn’t, reinforce from underneath the bench top into the back with spax screws. Once the back is attached to the bench, attach the 1/4″ plywood to the back of the frame. We made ours a little bit shorter so that it wouldn’t be visible from the side of the bench. We also attached mending plates (refer to plans) to give the bench back added support. We decided to fancy the bench up just a tad more by using scrap 1 x 12 pieces and cutting decorative corbels with our Ryobi Jigsaw. Drill 3/4″ pocket holes in the wide ends of the corbels and attach them to the bench top with 1 1/2″ pocket hole screws and wood glue. You might need to add a few 1 1/4″ brad nails from the back of the bench into the corbels while the glue is drying. You will need to fill the pocket holes with wood filler or Kreg Pocket Hole plugs. We applied one coat of Dark Walnut stain by Varathane to the entire piece and that was it – time for a pic 😉 You can find the stain we used HERE on Amazon. The best part about this piece is that it can be used it in so many places around your home. 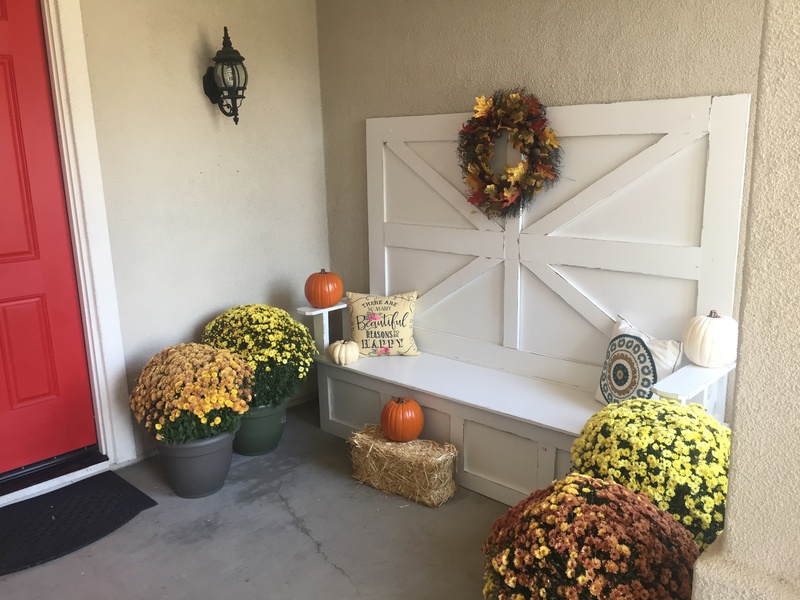 Entryway, dining room, mud room…. the list could go on! It’s easy to customize too, so make it yours and show us what you do! We decided to put it outside on our wrap-around-porch. Exterior white paint, distressed detailing and Autumn deco. I have a very large and wide hallway upstairs with one wall empty, do you think it would work there? Very Nice! How would I modify the plan to use the same bench for storage? Did you guys build this table too? If so, do you have the plans on your site? Thanks!! Probably a sill question but I’m wondering if it would be easier to attach the back after its in the house? I love this and may want to do this in my kitchen remodel. wish I could see a few more angles of how it looked in the entire room. any chance you have more pictures you could share? How much do you think I could sell this? Very nice! Thanks for the tutorial, it gives me ideas. Beautiful Beautiful! Always love the tutorials! thank you! !